When I changed from my old blog to this one, I wasn’t able to reproduce the look exactly, as the choices of ‘themes’ for the blog are different at WordPress. I would like to use the header picture from my old blog which, at the time of this writing, I have put back up. However, the only choices for using this picture are either to crop it into a very long, skinny shape (which wouldn’t look good at all) or switch to a theme, like the one I have up now with only one column. Readers have to scroll to the bottom to find category and archive lists, which I don’t really like. I could possibly learn to do some kind of magic programming, but I don’t think I can manage that. Anyway, I am working on it. I will probably end up taking a new picture in landscape mode, so that it will be the right shape and change things around, again. I just wanted to let you know so you wouldn’t think you had come to the wrong place if things change again soon. Just as our bodies cannot be optimally functioning without nutritious food and healthy exercise, our minds also need food and exercise. Charlotte Mason says that ideas are the mind’s proper food. I like to think of the mind’s proper exercise as being challenging context. Great ideas can be expressed simply or with the clothing of literary language and challenging writing — the times we have to work to understand something. As we don’t need to constantly challenge our bodies with exercise, we don’t need to constantly challenge our minds, either. However, the mind that is never challenged is like the soft, sluggish body of a couch potato. It will very quickly become weak and accustomed to lack of use, desiring only to be lazy. This is why I decided to begin to read through some of the challenging articles in the archives of the Parents’ Review and why I would love to have you join me. If you haven’t yet participated, I highly recommend beginning with this week’s article. It is not overly long (just over 3 printed pages) and it is not terribly difficult to understand. As with many of the articles, this one contains excellent ideas and timeless wisdom. Alice Powell, the article’s author, writes that although almost no one wants to admit it, most mothers whose children do not turn out as expected are disappointed. She is not speaking of the appearance of horrible character qualities, but rather of everyday differences. This disappointment seems to arise because parents (more often moms) long to see their children become like themselves. While logically, the idea of making a bunch of carbon copy human beings makes no sense, it nevertheless seems to be the desire of many parents. Powell points out that because so much of the child’s future rests with the mother, she needs to understand that this disappointment probably results from: poor parental management of a child’s early years and a failure to accept that each child is born with a distinctive character that cannot simply be parented into something else. Talking with my friend, Rachel, yesterday, we both admitted that in recent years we had made a conscious decision to stop reading parenting books. Partly, we did so because we found the authors had, really, little wisdom and limited (sometimes no) personal parentng experience, offering ‘cures’ for parenting problems that didn’t work for many families. Also for me, I found that parenting books often left me feeling inadequate and frustrated at my own inability to consistently carry out the suggestions. When a child disobeyed, at some point, I would inevitably be unable to come up with a good, natural consequence and would bark at the offender to go to her room. Sometimes, I would see books lying abandonned and would put them away myself instead of sacrificing a few minutes’ peace to follow-through and call the child in from outside to care for them himself. Occasionally, though, I do need a reminder of some general priciples in parenting. With good principles to think on, I can do the practical working out myself. I think this article had a few of these ideas to offer. Nothing more galls and annoys a child than to perceive that their ‘yes’ or ‘no’ depends on his parents’ moods. Gulp. I have been in an unstable mood for several months now (I think since I got my period back after our youngest baby’s birth). I can go from nice to irritable very quickly and have been doing way too much yelling lately, which is not really characteristic of me. A few days ago, I decided to make it a matter of prayer and attention. This concept hits home for me because I am sure our children have felt like this too often lately. Powell notes that children of moody moms learn to manipulate circumstances and manage their mothers to get what they want. Unfortunately, the more they do this, the more love is lost. Respect is, after all the true foundation of filial love, and where that is wanting there can be no real affection. She follows with the idea that moms often fail to earn respect because they “let little things disturb their equanimity,” and it is then impossible for her to maintain the calm, gentle composure necessary when dealing with children. Powell’s suggestion? Training ourselves in the habit of calmness in word and action. I don’t know about you, but I could use a refresher in the training of this habit. Our 4th child was a great trainer for me in her early toddler/preschooler years. She was extremely sensitive to scolding and would burst into tears at even a hint of harshness in a parent’s voice. As such, I quickly trained myself in calmness with all the children. I can remember once thinking I could not think of the last time I had raised my voice to any of my children! As she has grown a little, and necessarily toughened up, I have allowed myself to slide. I would like to devote some blog posts in the near future to the idea of retraining this habit in myself. I will give some practical ideas and some real-life examples from my home. (Trust me — there are TONS of calmness-training opportunities here!) I hope it will be inspiring and helpful to you as well as to me. Thoughts on the article? Please share in the comments section. As well, if you’d like to participate in the discussion but haven’t read the article yet, please don’t feel like it is too late. Even if you print it and read it tonight, the comments are always open and I would love to hear from you. I just can’t stand the Tupperware cupboard (and by Tupperware, I mean the generic word indicating all plastic-ware). First of all, I don’t like the way everytime I open the cupboard, things spill everywhere. Our only saving grace is that the doors have childproof openings. Only because of this do the doors even stay shut! I don’t like that I can never seem to find a container and lid that matches. I also don’t like to store food in plastic, but I am not at the place where I can or want to invest in something else. Yesterday was the day I would conquer the cupboard. Before the makeover -- not pretty. I wiped down the shelves to make them nice and clean. It wasn’t nearly as easy as I thought it would be. You would think that a plastics cupboard wouldn’t be very dirty, but that was not the case. I found a bunch of small to medium sized boxes and got a sharpie for marking them. I sorted the containers by shape: rectangular (including square), round, oval and plates/bowls. Each shape had its own box. I only put a container in the box if it had a matching lid. I labelled the boxes and put them back into the cupboard. A few larger things were put in loose, but they aren’t generally a problem. I admired my work, patted myself on the back and took some photos. The hard part will be training the kids to put things back properly, but I do find that once things have a VERY clear place to go this task is much easier. On Thursday, we will be looking deeper at the article, Disappointed Mothers written by Alice Powell in 1891. I encourage you to print it out and read it with a pencil in hand to underline/jot down comments on anything that strikes you. I would really enjoy reading your comments here on Thursday. I am participating in a knit-along group on Ravelry where the members are knitting all the patterns (one a month) from the book, Sock Innovation by my favourite designer, Cookie A. Each pattern is named after someone special in Cookie’s life. The first pattern, ‘Glynis’, is named after Cookie’s mother-in-law. It was a lot of fun to knit, though the socks are too small for me. I didn’t quite get gauge (I got 33 sts/4 in instead of the 30 sts/4 in suggested in the book), however I like my socks on the snug side and this kind of difference is generally fine. Not this time! The pattern is not overly stretchy, so the socks are VERY difficult to get past my instep. I did knit these toe-up and two-at-a-time, of course. 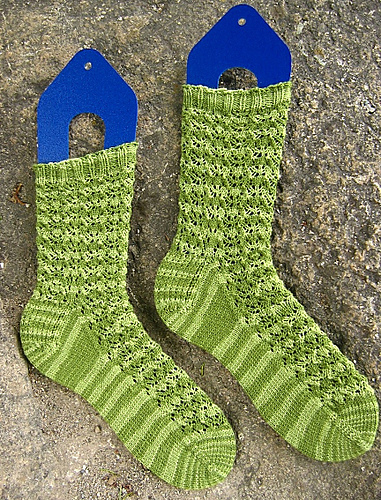 The yarn I used is exactly the same as the yarn used to knit the book’s sample, Shibui Knits in the wasabi colourway.